Writing is hard. There’s the problem of finding ideas rich enough to spin stories out of, the battle with self-doubt, the struggle to maintain focus, the financial insecurity and the frequent tangle with rejection. For most of us who write in English, however, the challenges largely end there. The same is not true for writers in many other languages. With the skewed international market favouring anglophone books, making a living is frequently even more difficult for authors in other tongues. In addition, those in regimes hostile to freedom of expression often have to contend with attempts to limit their work and their lives, an experience all too familiar to the author of my latest Book of the month. I first heard about Turkish writer Ahmet Altan a few weeks ago when I read an article by him in The Author, the UK’s Society of Authors’ members’ magazine. The piece was a striking account of what it is like to write inside a prison cell. The celebrated novelist and former newspaper editor is something of an expert on the topic: he has spent much of the last 18 months in detention for charges including ‘giving subliminal messages in favour of a coup on television’, ‘membership of a terrorist organisation’ and ‘attempting to overthrow the government’. I was gripped by Altan’s writing. Deeply personal and yet so lyrical that it almost tipped over into poetry at times, the article was a defiant assertion of the power of the imagination in the face of tyranny. I lost no time in seeking out one of Altan’s novels to read in English. Endgame, translated by Alexander Dawe, has been called a Turkish noir novel by several reviewers. The premise makes it clear why: a writer retires to a remote community only to find himself plunged into intrigue when the place reveals itself to be a hotbed of jealousy and murder. Having been turned into a killer himself, he sits alone in the centre of the town, awaiting the dawn and arrival of those who will surely come to seek revenge for what he has done. The novel spans this night, taking us back over the events that have led him to this point. So far, so dark and thrillerish. Indeed, the early pages contain many passages that could cheerfully sit in any number of mystery novels written around the world. From the suspenseful evocation of the sinister and controlling Mayor Mustafa, to loaded hints about strangers being unwelcome and rumours of shady activity surrounding the ancient church on top of the hill, where treasure is thought to be hidden, the text is rife with mechanisms calculated to keep the pages turning. There are also a number of local details that are as intriguing as they are disturbing – the hitmen who are so nonchalant that they arrive in minibuses, for example. ‘You’re sitting there reading the horse racing pages and some guy comes and blows your brains out. A brain picturing galloping horses was suddenly splattered over the coffeehouse floor, sending imaginary horses racing through the grass. I could see the jockeys in colourful outfits riding on their backs. All of the hopes and schemes, frustrations and desires, jealousies and passions that had resided within the folds of that brain were then washed away with a bucket of water. There is beauty and wistfulness in much of the writing. The opening sequence, for instance, in which the protagonist claims to be able to see the town’s sleeping inhabitants’ dreams escaping out of windows and chimneys to frolic together is touching. The same is true of insights such as: ‘We can’t fit a whole person into one life. This life we live is too small for all desires.’ These are the kind of observations that resonate across cultures and genres, and stay with you long after plot and character detail are gone. Some aspects of this book will be challenging for those used to mainstream anglophone fiction. The frequent references to God and sin are striking; although the protagonist claims not to be a believer, he frequently rails against the creator, often chiding Him for placing him in a badly plotted novel. In addition, the earthy and occasionally misogynistic presentation of women may be off-putting for some – the narrator has no hesitation in indulging in a little objectification now and again. There’s also the challenge of unfamiliar pacing, which sometimes sees Altan lingering over a scene or idea that an English-language writer might hurry through and visa versa. Such wrinkles in alignment are almost inevitable, however, when it comes to encountering literature from elsewhere. Indeed they are often part of the joy. And if it’s joy you’re looking for, this book has plenty to offer. Funny, thoughtful, savage and audacious, this is a novel that will enthrall and surprise. Like its author, it cannot be constrained within boundaries set by others. It is entirely itself. #AhmetAltan #FreeTurkeyMedia Find more information on the campaign to free Ahmet Altan here. Last week I had the great honour of delivering the 26th Annual Mortenson Distinguished lecture at the University of Illinois in the US. The Mortenson Center was founded through the generosity of C. Walter and Gerda B. Mortenson, who believed that librarians sharing information is one of the shortest and surest roads to world peace. Since 1991, the organisation has provided training to 1,300 librarians from more than 90 countries. It has also raised $2.5m-worth of grants to strengthen skills and modernize libraries. So you can imagine my delight at being asked to contribute to the final celebrations marking its first quarter-century. The next morning, following a jog round campus and a brief spell going over my notes, I was picked up by Rebecca from the centre and taken to the library in which the Mortenson Center is housed. Although the no-gun signs on the doors felt forbidding, the library was anything but. I was delighted to see a large number of students enjoying the space in the subterranean building – built that way so as not to overshadow a historic experimental corn field, one of the first of its kind. I particularly liked the board of questions posted up for graduate researchers to answer, featuring a query as to whether Jack and Rose would both have fitted on the floating door in the film Titanic. This, along with several others, was addressed in great detail. There was no time to ascertain the answer, however, as Rebecca whisked me off to the Mortenson Center, a small but intriguing space filled with gifts brought by many of the librarians who have visited over the years. A string of prayer flags hung over the sofa area, while a cabinet by the door of director Clara M. Chu’s office boasted ranks of trinkets, dolls, ornaments and mementos. After lunch, the first of my events was a Chai Wai (or public dialogue) with former Mortenson Center director and author Marianna Tax Choldin. Her latest book, Garden of Broken Statues: Exploring Censorship in Russia, is a compelling and moving account of her decades-long fascination with the Soviet Union and Russia, which she has visited more than 55 times over the course of her career. It considers the personal and social effects of censorship and reveals the importance of a concerted effort to understand the past. Chaired by former American Library Association’s Office for Intellectual Freedom director Barbara M. Jones, the discussion proved lively and wide-ranging, as you can see from the video of it here. Though the audience was small, there was no shortage of questions and we covered everything from the intriguing Japanese film Library Wars: The Last Mission (definitely on my to-watch list) to One Day in the Life of Ivan Denisovich, a classic to which both Tax Choldin and I refer in our books. Next came the investiture of the Mortenson Center’s third director and distinguished professor, Clara M. Chu, and a celebration reception. Then it was my turn (you can watch the video of the lecture if you’d like to see how it went – my presentation starts at about 17.53). Saturday was my last day in Illinois and Clara Chu and I spent it visiting Springfield, home of Abraham Lincoln, often said to be the US’s greatest president. There, alongside a welter of insights into Lincoln’s rise from lawyer to world leader, his efforts to champion the abolition of slavery, the horror of the American civil war and the pity of the great man’s assassination, I learned an interesting fact: each president has his (or perhaps one day her) own library. For every American leader, there is a small army of people sorting, ordering and safeguarding the historically significant documents associated with their time in office so that others may learn from them. 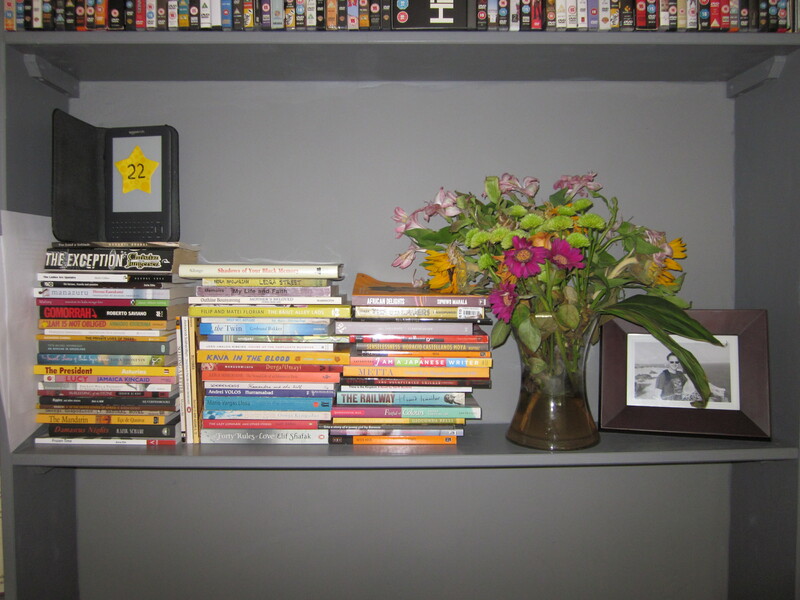 Important though books are, my visit to Illinois reminded me, they are limited without the people who organise, promote and – all too often – have to fight attempts to keep others from reading them. Librarians are at the forefront of these efforts. And as books such as Ali Smith’s Public Library and Other Stories demonstrate, they have been essential in drawing out and shaping many an aspiring wordsmith. This is one of the reasons why I’m also delighted to have got involved with another library-centred organisation recently. The Global Literature in Libraries Initiative aims to make more resources and techniques available to librarians to help them encourage readers to explore books from around the world. Founded this year and already numbering 345 members, the project will run workshops, produce catalogues featuring excellent translated books and suggest tactics such as pairing unfamiliar works with popular titles to help readers venture further. Both the Mortenson Center and GLLI are funded by donations and would appreciate any help you can give (click the links to find out more). Hopefully, soon librarians everywhere will have the tools to help anyone who wants to to read the world. Pictures courtesy of the Mortenson Center for International Library Progams. There can be few more striking juxtapositions than the one found in the title of Abnousse Shalmani’s memoir Khomeini, Sade and Me. Indeed, it’s unlikely that the names of the ultra-conservative founder of the Islamic Republic of Iran and the notorious French aristocrat who penned some of the most violent and explicit literature ever published have ever found themselves staring at each other over a comma before. The jarring effect of the title is entirely fitting, however, for it encapsulates the gulf that its author has crossed in the course of her life – a feat that forms the basis of this, her first book. Jumping from her childhood to her present-day existence, as well as to many incidents in between, the narrative records the reasons for and consequences of Shalmani’s atheist family’s decision to leave Iran for France a few years after the 1979 revolution. In so doing, it provides a framework for the writer to set out and interrogate the conflicting forces that shaped her, as well as to explore the immigrant experience, and build passionate arguments for equality and free expression. The controversy inherent in the title is reflected on every page. This is an angry book and Shalmani pulls no punches in pillorying Khomeini and the fundamentalist men and women – dubbed ‘Beards’ and ‘Crows’ – who champion a creed to which she cannot subscribe. Many of her arguments, such as her vehement opposition to Muslim women wearing the veil, make for challenging reading – particularly in light of France’s recent burkini scandal. Shalmani is well aware of this. For many, she writes, she will be ‘just a woman that comes off as a racist when she fears for the future of other women’, yet she will not give ground in the face of those for whom ‘open-mindedness is just a way of washing their hands of the matter’. Indeed, she makes no attempt to help her case or soften her words, thinking nothing of dismissing those who disagree as ‘idiots’. The reasons for Shalmani’s vehemence are two-pronged and have their roots in the men featured in the title of her book. On the one hand, there is the extreme suffering that she and her family went through when their values clashed with those of their homeland’s new regime; for Shalmani this plays out particularly strongly in gender issues and the attempt to police women’s bodies not just in Iran but throughout the world because ‘each culture has its own women’s prison’. On the other hand, there is the ‘divine Marquis’, whose writings remade her and changed her thinking for good. With such a literary hero, it is small wonder that Shalmani does not shrink from causing offence and expressing herself as powerfully as she can. This does her work a disservice occasionally. At points, it makes her writing seem as dogmatic as the teachings of those she attacks. In addition, the fervour with which she expresses love and admiration for her adopted country, France, can sometimes sound a little naive. On the whole, though, her passion is compelling. Many readers will not agree with all she says and some may be offended, but that is, in a way, the point: this book is a reminder that outrage should be part of the reading experience. It demonstrates that words ought to stretch, challenge and unsettle us. And it is a stark demonstration of the terrible things that can happen when there is no space left in which to question or offend. At a time of great turbulence and uncertainty in many parts of the planet, it’s easy to feel overwhelmed by the number of alarming news stories flooding our airwaves, newspapers and screens. Nevertheless, yesterday I came across a story that shocked me profoundly. According to the Independent, Faizah Shaheen, a British Muslim woman, was detained at a UK airport and questioned under the Terrorism Act after an air steward reported her for suspicious behaviour last month. And the suspicious behaviour in question? The 27-year-old National Health Service worker had been reading Syria Speaks, an award-winning art and culture anthology showcasing the work of more than 50 writers and artists challenging violence in their war-torn nation. Far from an extremist text promoting radicalisation, the book had actually been supported by English PEN, the charity on whose translation funding panel I often sit. Yet, because an air steward thought it suspicious, Shaheen returned from her honeymoon to face 15 minutes of distressing questions from UK police. This may not sound like much in the face of the extreme hardships and atrocities affecting many others around the globe. However, it points to something deeply disturbing and intimately connected to the cruelty being inflicted on millions by extremists, despots and inhumane policies. As I discovered during my quest, a sure way to increase our understanding and appreciation of one another’s humanity – and thereby to promote peace – is to share our stories. By imagining the world through other people’s eyes in the extraordinary way that stories enable us to do, we enlarge and enrich our vision, and become better able to respect, value and talk meaningfully with one another. To do this, people need to be able to read without looking over their shoulders, without fear of penalties or reprimands. When a person picks up a book, their focus should be on whether they will enjoy it and what they might get from it, on how it could broaden their horizons, rather than on how being associated with it might limit or threaten them. Without this freedom, the world shrinks and fragments. Frightened to venture beyond the bounds of sanctioned subject matter, we find ourselves locked in an echo chamber, where the same ideas and perspectives reverberate at us time and again, and the Other becomes ever more inscrutable and strange. Living in that sort of bubble, our appreciation of the humanity, complexity and dignity of those who do not conform to our mores quickly dulls and fades. And when that happens, discrimination, violence and persecution of those others ceases to seem unacceptable, because they are increasingly hard to imagine as people at all. That is why Faizah Shaheen’s detention enrages me and should enrage all those who value and believe in the free circulation of literature. That is why I join English PEN in condemning what happened. Because, on a fundamental level, the cruellest things human beings do to one another stem from precisely this: preventing people sharing ideas and stories. Picture by Konrad Förstner on Flickr.com. 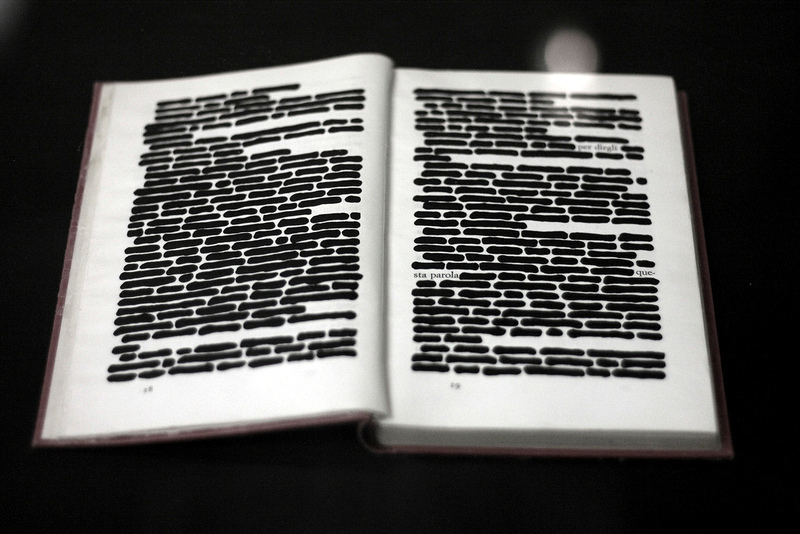 How does censorship affect a writer’s career? A controversy in New Zealand has this month brought the issue of banning books to many bibliophiles’ attention around the world. At the centre of the storm is Ted Dawe’s award-winning Into the River, a Young Adult novel that follows a Maori teenager who wins a scholarship at an exclusive Auckland boarding school. The book has been out for two years, but on September 3 it was withdrawn from bookshops and libraries after a Christian group objected to its sexually explicit content and portrayal of drug use. While New Zealand’s Film and Literature Board of Review decides whether or not to issue a permanent ban, any company caught distributing the book in the nation faces a fine of up to NZ$10,000. It is the first time a title has been restricted in this way in the country for around two decades. As censorship was a big issue I encountered during my year of reading the world, the story threw up several interesting points for me. The first was the curious and counter-intuitive effect that bans like this tend to have in much of the English-speaking world. Although such steps are rare in New Zealand, there have been attempts to restrict certain titles in other Anglophone nations in recent years, with the Harry Potter books, To Kill a Mocking Bird and even The Diary of Anne Frank drawing challenges. What’s interesting about such episodes is that they almost invariably result in precisely the surge of publicity and sales that these works’ opponents would most like to avoid. Although NZ librarians reported borrowing rates for Dawe’s novel dropped when it was first given a warning sticker in December 2013, the latest events have brought Into the River international renown. My first action on hearing about the ban was to order a copy – something I would probably not have if the book were freely available, given that it is aimed at teenage boys. Granted, the restrictions on distribution may hamper sales inside New Zealand in the short-term, but the widespread media coverage will fix Dawe’s name in many minds for a long time to come and will no doubt drive sales of his other titles, whether Into the River returns to the shelves or not. The second thought for me was how sharply this situation contrasts with the issues facing authors working in many other languages and under much more restrictive regimes, where the media does not have the ability to challenge similar decisions and hold authorities to account in the same way. Throughout my project, I came across a number of writers whose careers had been stunted and sometimes cut short by often brutal attempts to limit their freedom to write what they felt they must. When I researched my book Reading the World, I interviewed several of them at length, in particular Uzbek writer Hamid Ismailov and Turkmen writer Ak Welsapar. They had both been forced to flee their home countries in fear of their safety and even their lives. As they explained to me, rebuilding your career in another language is a huge challenge for an exiled author. Welsapar, who now lives in Sweden, even went so far as to call it a tragedy – not surprising when you consider that the unpublished translation I read of his novel The Tale of Aypi remains without a publishing deal, despite it being the first book ever translated directly from Turkmen into English. More than 20 years after they fled their homelands, Ismailov and Welsapar have nevertheless made admirable progress. Ismailov has had several works published, most recently his acclaimed novella The Dead Lake, and was writer in residence at the BBC World Service for several years. Meanwhile, Welsapar has been published in Swedish and Russian, and he was the Turkmen poet at Poetry Parnassus, a cultural event organised to complement the London 2012 Olympic Games. I was particularly delighted that both writers had short stories featured in the summer 2015 issue of the excellent Index on Censorship magazine. For Welsapar this represented almost the first prose work he has ever had published in English. Not comparable to the worldwide attention Ted Dawe’s novel has received over the past few weeks. But at least it’s a start. 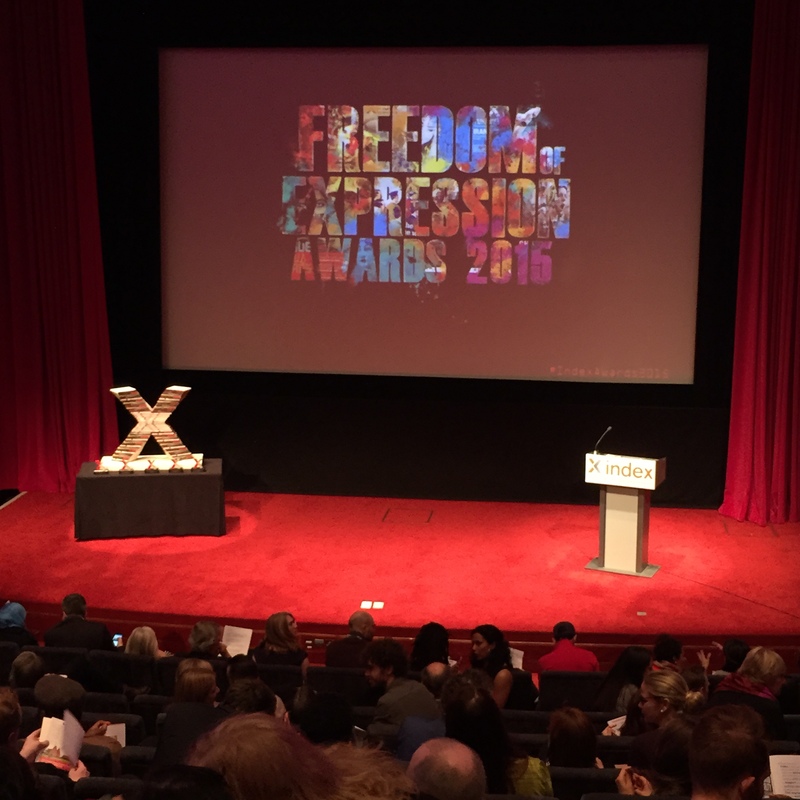 Last night Steve and I had the honour of being guests at Index on Censorship’s gala award ceremony at the Barbican Centre in London. Set up in 2000, the Freedom of Expression Awards celebrate some of the bravest and most creative champions of free speech around the planet, and highlight the sinister efforts of numerous regimes and other organisations to censor and silence dissent – an issue I encountered many times during my Year of Reading the World. The evening combined a number of wonderful experiences. It was the first time we had ever been in the Barbican’s cinema and lush garden room, where we relished sipping something bubbly and looking at the artwork Index has commissioned from cartoonists around the world in the wake of the Charlie Hebdo attack. I particularly liked the picture by Burkinabé cartoonist Damien Glez, which showed a small boy with one tiny, squashed speech bubble next to a massive, bloated and suited bureaucrat or politician, whose robust pronouncements filled the rest of the page. It was also the first time I had seen comedian Shappi Khorsandi perform live. She was hosting the event and spoke with great wit and humour about her family’s experience of fleeing Iran after her father published a satirical poem. ‘A fatwa is the Iranian equivalent of an Oscar,’ she quipped. But by far the most powerful experience of the night was hearing about the nominees in each of the four categories – Journalism, Campaigning, Digital Activism and Arts –and listening to the winners’ speeches. From Kenyan women’s rights activist Amran Aboundi, who dedicated her award not only to those she has helped on the Somali border but also to the people who have threatened her because of her work, to Moroccan rapper El Haqed, who has been imprisoned three times and finished his speech with a performance of one of his hits, the people honoured were an extraordinarily inspiring bunch. We heard from Saudi documentary maker Safa Al Ahmad – who defied the laws restricting women’s movements to make the film Saudi’s Secret Uprising – about the preciousness of facts in a society where the media is the mouthpiece of the state (you can watch her film below). Meanwhile Angolan journalist and activist Rafael Marques de Morais spoke bravely about the court action he must face in his home country, where he is being sued by numerous powerful figures whom his work has exposed. The experience would only empower him further he said. Closer to home, Hungarian journalist Tamás Bodoky, founder of Atlatszo.hu, talked about the need for investigative journalists to ‘position ourselves outside the mainstream media’ because most outlets have come to ‘represent the interests of local oligarchs’. In addition, exiled Azeri journalist Idrak Abbasov won a special award in recognition of the dangers that he and many of his colleagues face under the vicious crackdown on free expression in Azerbaijan, where several journalists have been murdered in recent years. By the time actor Simon Callow stepped on stage to end the evening by speaking about his long-term support for Index and to appeal for donations, no one was in any doubt as to the huge amount of work that has to be done to win and safeguard freedom of expression in every society. After all, there are plenty of places where even writing a blog post like this is a risky business. And the distance between those places and those of us living in so-called ‘free’ societies is smaller than we might like to think. This book breaks the rules. So far, everything I’ve read for this project has been written and published since the country in question existed in its modern-day form (hence the fancy footwork getting a story from South Sudan). However Too Loud a Solitude by Bohumil Hrabal first appeared in 1976 in what was then Czechoslovakia — in the days when the Czech Republic was nothing more than a figment of Communist leader Gustáv Husák’s nightmares. I say ‘appeared’, but that’s not quite right. In fact, because of the repressive mechanisms of the state at the time, the book was self-published secretly. It wasn’t until 1989, around the time of the Velvet Revolution – when the country moved from Communism to liberal democracy paving the way for the split from Slovakia in 1993 – that it came out officially. This made it the last novel that Hrabal, dubbed ‘the sad king of Czech literature’ by one biographer, published before his death. Clearly, this was an important literary milestone on the road to the new republic. I was going to have to take a diversion and have a look. As antiheroes go, they don’t come much more dubious than Hanta, an eccentric loner who has spent 35 years crushing outlawed books and waste paper in a sinister police state. Working alone with his hydraulic press turning rare book collections into bales of compacted paper, he is an agent of forces that all freethinking readers must abhor. Yet, as we enter into Hanta’s ‘heavily populated solitude’, we come to discover the love of books that he has developed through his work and the inadvertent education it gives him. As we read about the care he takes over the thousand of volumes he processes – and often rescues for his private collection – we encounter one of the most moving, passionate and devastating testaments to the power of literature the world has ever seen. Hrabal’s descriptions of a book lover’s interactions with texts on every level are extraordinary. From Hanta’s accounts of his reading fuelling ‘an eternal flame I feed daily with the oil of my thoughts, which come from what I unwittingly read during work’, to the thought he puts into the construction of bales – frequently placing a favourite text in the heart of them or a picture that might catch someone’s eye from the side of the truck that transports them for pulping – we inhabit his obsession with books as objects and as windows on other worlds. ‘pulling covers off books and tossing the bristling, horrified pages on the conveyor belt with the utmost calm and indifference, with no feeling for what the book might mean, no thought that somebody had to write the book, somebody had to edit it, somebody had to design it, somebody had to set it, somebody had to proofread it, somebody had to make corrections, somebody had to read the galley proofs, and somebody had to check the page proofs, print the book, and somebody had to bind the book, and somebody had to pack the books into boxes, and somebody had to do the accounts, and somebody had to decide that the book was unfit to read, and somebody had to order it pulped […] and somebody had to drive the truck here, where workers wearing orange and baby-blue gloves tore out the books’ innards and tossed them onto the conveyor belt, which silently, inexorably jerked the bristling pages off to the gigantic press to turn them into bales, which went on to the paper mill to become innocent, white, immaculately letter-free paper, which would eventually be made into other, new books’. This understanding of destruction as part of the life-cycle of beautiful things is threaded through the text on every level. The same phrase starts each chapter before buckling under the pressure of the final section, while the plot itself, led through a spiral of literary references that are devoid of pretension and grounded in Hanta’s engagement with the beating heart of the texts he reads, folds in on a conclusion that is every bit as inevitable and necessary as it is heartrending. An astonishing piece of work. I’m not sure I’ll ever quite get over it.